Minister of Culture in Norway, Trine Skei Grande, made the official opening of Norway House in Berlin today - where Norway is Country in Focus. At 11.30 today Executive Director Sindre Guldvog of the Norwegian Film Institute welcomed the Minister of Culture, guets, press, audience and the film-business to the official opening of Norway House in Berlin. I have been looking forward to this for hours, days, months – a year actually, Guldvog said. 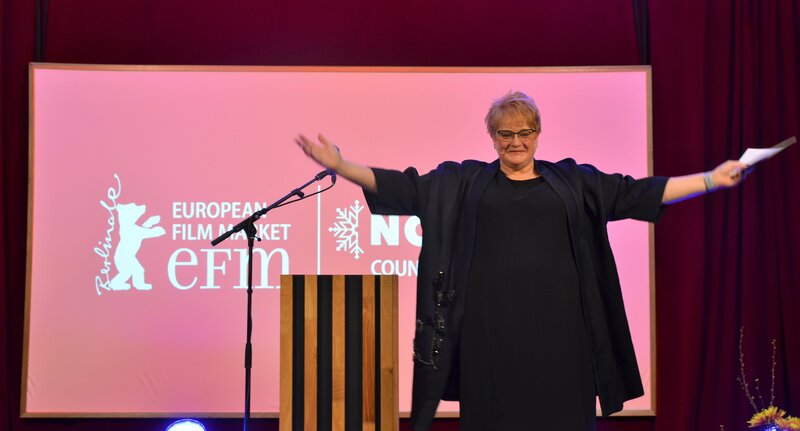 Trine Skei Grande was just appointed Norwegian Minister of Culture when the deal was signed during the Berlinale last year - for Norway to be Country in Focus 2019. Today she opened the house – 300 squaremeters of Norwegian film, filmculture and business. This week the house will be filled with seminars, pitches, debates, press-conferences – and Norwegian and international guests. "Finally the time has come. We are here. In the fantastic Norway House, as "Country in Focus" at one of the world's most important film festivals. 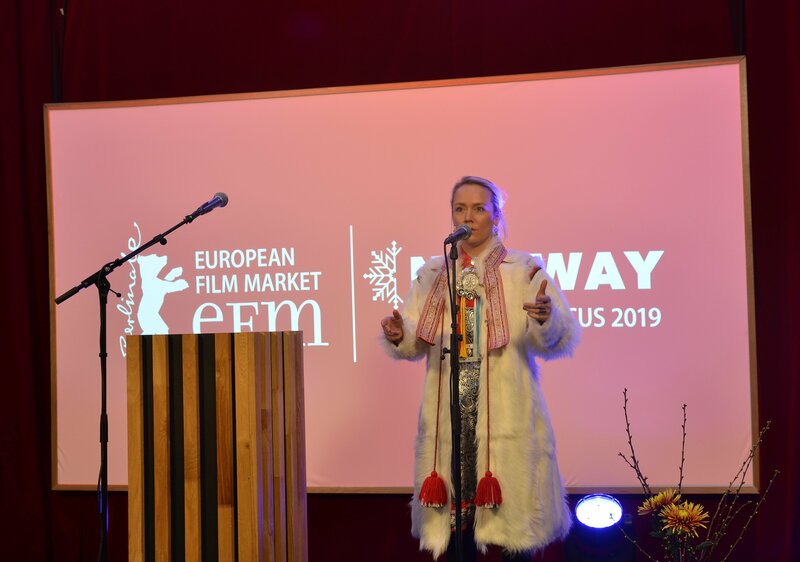 I am proud and at the same time excited this opportunity to present and promote the quality that Norwegian films and Norwegian artists represent. Why is it of such importance to engage in international arrangements in the field of culture? Why are we gathered here today? To promote Norwegian quality, and expand the range of the Norwegian film industry, of course. But also to highlight the importance of cultural alliances. Norway is the first Country in Focus to build a separate house for its festival scene, just across the street from the European Film Market – it will accommodate representatives of the Norwegian Film Institute, the Filmreg organisation, the country’s film commissions, Sørfond and the Virke Enterprise Federation. There will also be stands for Norwegian service and equipment suppliers for film productions, including Daylight, Skeie Seating, Camera rental, Spectrum light & scene, DVnor/Nettkino, Storyline, Gimpville and North. Tonight Sami artist Elle Marja Eira gave a beautiful joik for the audience in Norway House, opening the evenings focus on Indigenous filmmaking, supported by International Sami Film Institute. With support from the Ministry of Culture, the Ministry of Foreign Affairs, the Norwegian Embassy in Berlin, and in collaboration with the Norwegian film industry and the European Film Market, the institute will focus on the best Norway has to offer to the audiovisual industry, also promoting Norway as a recording country for foreign films and series in a market with participants from 130 countries. In addition Norway's and production companies film workers and up-coming talents will get the chance to show off their projects and liaise with new contacts. "We will use this unique opportunity to highlight Norwegian series, feature films, short films and documentary films for a major international audience," explained managing director Sindre Guldvog, of the Norwegian Film Institute. Apart from being the Country in Focus this year, Norway also has a historically strong lineup in the festival programme, including Hans Petter Molands fourth entry in the Competition programme, this time with a drama based on Per Petterson highly acclaimed novel Out Stealing Horses, starring Stellan Skarsgård. In the Generation Kplus-programme, a stop motion animation from Norway has once again made it, and for the second time, its with the characters Louis & Luca - Mission to the Moon (dir: Rasmus Sivertsen). In addition to these films, there are also the two short films Dad and She-Pack and finally the documentary film False Belief in the Forum Expanded-programme.